I have recently started another blog for work that I am doing as a way of keeping in contact with my students while they are away from University on their teaching placements. I had thought about using blogs for work before and have done some short inputs about using blogs but this year I have had a couple of students who have been very keen so we are all doing it. I have also realised that it is a very good way of keeping all my good ideas, links etc. in one place for my students to be able to share and comment on. Doing all this and explaining what I see as the benefits of blogging have made me realise just how much I get out of having my own blog and how much I really enjoy all the contact with my ‘imaginary friends’ as Thimbleanna calls them. I am thrilled that so many people visit me – around 4000 a month now – about half of whom are looking for info on re-enactment or historical subjects and love the fact that I am part of this big network of people all sharing things. The first two blogs I ever read were Mary Kathryn’s needlework blog and Crazy Aunt Purl’s knitting and general coping with life blog. These two women have had a big impact on me in so many ways over the last four years which is remarkable as we have never met nor are likely to – though I hope to go and visit their parts of the USA sometime soon. I have been very impressed by their craft skills, their attitude to coping with life’s little (and big!) ups and downs and have loved the way that they have shared so much of their lives and their passion for all the things they do. Other blogs have been added to my favourites along the way – usually as links from people’s blogrolls or posts and I have been entertained and awed by so many talented people. It is very difficult to describe what you get from this to non- bloggers as I know people (and my kids!) often look at me a bit strangely when I try and describe how I feel about being connected, inspired, uplifted, amused and generally made very happy by reading everyone’s posts. To me it is like having lots of pen pals – with the added advantages of seeing pictures of so many lovely things all the time Hen House’s gorgeous vintage quilts, Do You Mind if I Knit’s cute doggies, beach walks and fabulous art, Crazy Mom’s lovely quilt work, Don’t Look Now’s wonderful original designs to name but a tiny few. You are all wonderful imaginary friends and thank you so much for sharing. As well as all the craft love and the free patterns and the like I also love the ‘extras’ that blogging brings to my life. One of these has been the chance to read a really good book as I have been participating in Crazy Aunt Purl’s latest book club. It has been a very last-minute participate as my copy only arrived on Friday and we are going to post about the book tomorrow so I have spent most of the weekend reading. The book chosen is When We Were Strangers’ by Pamela Schoenewaldt based on one of my favourite subjects, that of emigration to the USA – in this case an Italian seamstress in the late 1880s. It is really good, I am intending to finish it tonight and would recommend it to anyone . I will be passing it on to my Mum when I next go to Spain as I am sure she will love it. It has been a very literary week one way and another – I have not done much in the way of crafting this week, have been very tired so have been going to bed early with lots of good reads , a friend from knitting, Cath, lent me two of the Benni Harper quilt murder mysteries by Earlene Fowler and I have really enjoyed those. I have always loved a good murder mystery, being a lifelong Agatha Christie fan, and have recently read Agatha’s biography and autobiography ‘Come Tell me Where You Live’ which was very interesting. The Benni Harper books are particularly good in terms of the way the characters are written, I really identify with the main character and can’t wait to read more of the series. This week there was of course World Book Day which I have always promoted as part of my job and the new World Book Night where a million books were given away by people who had registered with the scheme. My friend Barbara from knitting who has a wonderful blog about knitting had registered to get copies of Nigel Slater’s autobiography Toast so I went along to my friend Lydia’s wool shop, Spun, yesterday to collect the book and have a little knit and natter. As soon as I have finished the book club novel and the other couple I have one the go – another Laura Ingalls Wilder biography and a history of the National Trust Ellie gave me for Christmas I will start on that one then pass it on to my sister-in-law Amanda who is a very keen cook. I love reading and am a huge fan of print books – I have seen and admired other people’s Kindle’s and i Pads but I think I will be sticking to my old-fashioned books for a long while yet – I love buying books and spend far too much on them (aided by the lovely Amazon wish list!) but just think it would not be the same to have a download rather than a thud on the doormat when another lovely tome is delivered. Lovely colours and look there is sun - in my dining room, in Yorkshire - hurrah! What a fun read! Isn’t blogging fun? When you move into a real neighborhood, you’re pretty much “stuck” with whoever lives there — I look at blogging as being able to choose your neighbors — and we choose ones who share our same interests! I’m so impressed that you can remember the first blogs that you read. I just remember blogs being there all of a sudden — and I loved it. 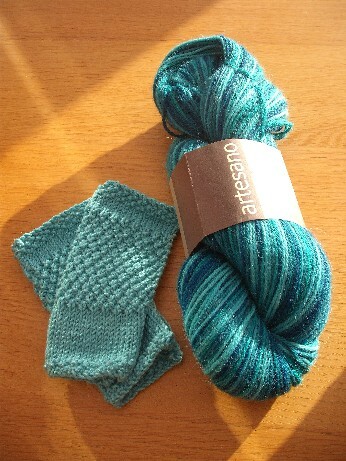 I Love the yarn and the pretty wristwarmers!